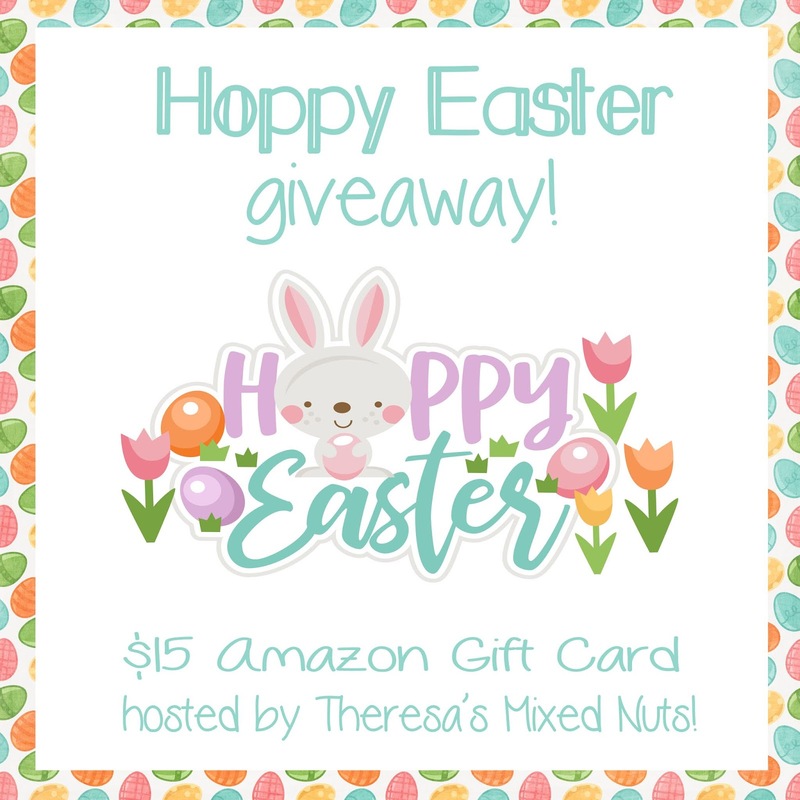 Theresa's Mixed Nuts: Hoppy Easter Giveaway! Hippity Hoppity, Easter is on its way! To add to the excitement of the upcoming holiday, I thought I'd host a reader giveaway. Up for grabs is a $15 Amazon Gift Card to tuck into your Easter basket or to use for holiday fixins. The giveaway is open to all and will end on 4/21/19. The winner will have 24 hours to respond to winning email before a new winner is selected. So, hop to it and enter on the giveaway widget below! Hope you will have Nice Easter this year, deary, although I'm guessing you will be a busy bunny indeed! Easter with a newbie in the house should be fun at your sea. I'll just be glad to have a long weekend from the crummy 9-5 crap. No little ones here but I know if it was me a chocolate bunny would be a must! Well...Mica said he wanted a Playstation. He's not getting that! I don't think Isaak still believes, but the cat's not out of the bag so to speak. They are getting shirts, books, cleaning supplies and candy. Heads up: Your Instagram link isn't working to see the sponsor. I think my grandsons would like everything they could get there little Hands on! Have a very Happy Easter! Easter dinner at my brother's house with the whole family this year. Grandson will be getting books to read in his Easter basket. Mom & Dad said no candy. My Granddaughter would love some LOL’s in her Easter basket this year. Besides the requisite candy, my nieces enjoy getting spring toys like sidewalk chalk, bubbles and jump ropes. My daughter want Reese's Peanut butter eggs and Lindt chocolates in her Easter basket. My kids are grown. We give a zoo membership to our local zoo for the kids and grandkids every Easter. My daughter would like chocolate & Hatchimals in her basket. my kids really just always want candy. My oldest son would like two 15Lbs dumbells. My youngest never specified anything. They will be getting a set of dvds they have been wanting. The number one request in my family is always chocolate! Happy Easter to you and your family, Theresa! Thank you Louise! Same to you and Terry! We love socks, candy, and gift cards! My boyfriend wants an Easter basket filled with reese's easter eggs. Why not? They always love to see chocolate in their Easter baskets. My son loves candy and chocolate in his Easter basket, of course! But he also gets excited for small toys like bubbles, chalk, Pokémon cards. They always like chocolate in their Easter baskets. I don't have any kids, but my dog wants treats and toys in her basket. No kids. I want lots of Reese's Peanutbutter eggs. My children want Reese's eggs in their Easter baskets. My kids wanted new wireless headphones as well as candy in their Easter baskets. No kids, but I am one. I like chocolate eggs, dvds, figures, etc. My kids want candy, toys and books in their easter baskets! 🐥🐇🥚 Please forgive me for the repost if one pops up. I didn't see my comment post. My kids want Reese's Peanut Butter Eggs and chocolate bunnies in their Easter basket. I put Easter candies, Hatchimal eggs, educational flash cards and a mini gardening set in my daughters Easter basket. My daughter wants anything unicorn in her basket. My son wants cars in his and they both want chocolate.